aibo, Sony's robot in the shape of a puppy, is available from today (September 18, 2018) for purchase in the US. This event is being dubbed the "First Litter" release of the mechanical pets. Sony claims that aibo can learn to recognize up to 100 faces and develops a unique personality based on how it is treated. 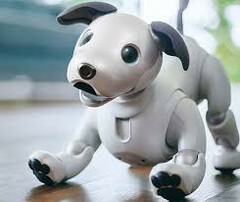 Sony Electronics has released the "First Litter" edition of the latest generation of aibo for potential customers in the United States. aibo is a robot in the shape of a puppy. It is programmed to mimic a real dog, with the ability to bark, play and perform tricks in response to voice commands. This "First Litter" package contains an aibo unit, its pawpads and charging station. It also includes an "aibone" and a pink ball, with which aibo can interact, and a commemorative dog-tag with a unique ID. aibo also includes cameras and sensors to perceive and react appropriately with its environment. Sony claims that aibo also has the AI capabilities necessary to 'learn' its owner's face, different responses to how it is treated and how to act in order to please its owner. It can record and learn to recognize up to 100 different faces. Each aibo stores this information via a service called AI Cloud Plan. A "First Litter" edition aibo also comes with 3 years' worth of this plan. Sony did not mention what owners do after the third year is up, though. aibo also has an app (Android or iOS) so that their owners can stay connected to their robo-puppy. It seems that buying a "First Litter"-edition aibo will be as serious a decision as that to get any pet would be: each package has a recommended price of US$2899.99. Therefore, anyone wanting one may need to realize that aibo is not just for the upcoming holiday.